Analysis and overview of the accents of German and Dutch speakers with practise material for actors. 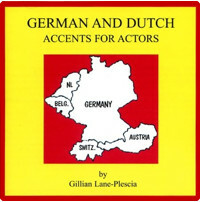 German and Dutch Accents for Actors helps you acquire or perfect accents for performance. The instruction is by well known dialect coach Gillian Lane-Plescia based on recordings of men and women speaking in their authentic accents, not people imitating an accent. The CD includes examples of male and female native speakers from several parts of Germany and from Austria and Switzerland; as well as features specific to Dutch speakers. The accompanying small format Booklet come with with analysis, International Phonetic Alphabet (IPA) notations, notes on samples and lists of other sources. The German and Dutch Accents for Actors Booklet and CD set is small and lightweight, fitting easily into your pocket or bag. Gillian Lane-Plescia is a full time, freelance accent and dialect coach who has worked for over 30 years with actors of all kinds, including such well known actors such as Matthew Broderick, Estelle Parson, John Malkovich, Brian Dennehy, John C. Reilly, Uma Thurman, F. Murray Abraham, and Gary Sinese. Her popular self-teaching dialect and accent CDs for actors are used by organizations throughout Canada, England, Australia, Europe and America, from leading theatres such as the Guthrie and the Alley to University theatre schools, community theatres and high schools. Gillian Lane-Plescia was born and educated in England and trained in the Drama Division of the Royal Academy of Music in London. After moving to the US in the 1960s , she got her MA in Theatre from Florida State University and began teaching voice, speech and dialects. She is currently on the faculty of Juilliard's Drama Division and National Theater Institute of the Eugene O'Neill Center. Formerly director of voice training for the M.F.A. programs of the Universities of North Carolina and Michigan, she is very active as a freelance voice and dialect coach at many New York and Regional Theatres including Arena Stage, Alley Theater, Center Stage, Classic Stage, Goodman, Guthrie, Hartford Stage, Huntington, Long Wharf, New York Public, Seattle Rep, Steppenwolf, Shakespeare Theater, and Yale Rep.